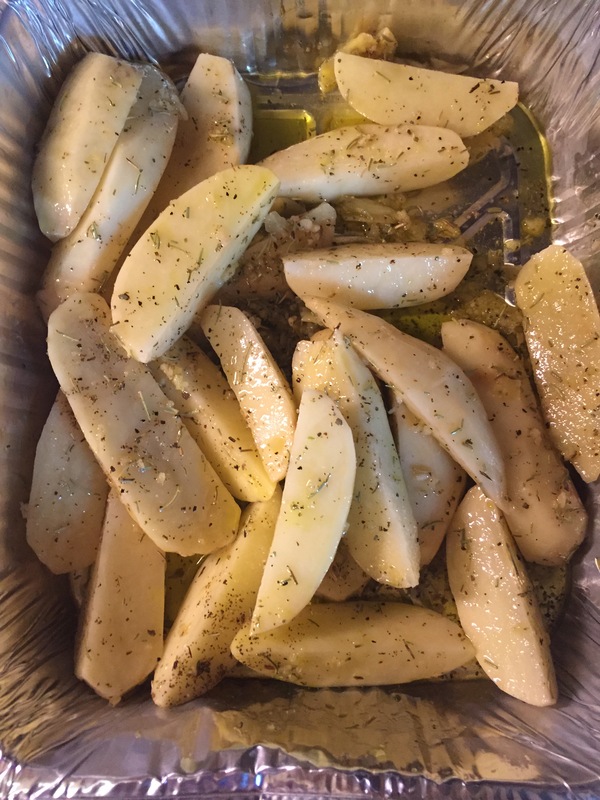 Roasted rosemary garlic potatoes with olive oil. Easy, delicious recipe for a family dinner or a holiday feast! This is my go to dish when I am feeling lazy, but want to whip up something presentable. It takes some time, but the best part is that you can leave it in the oven and forget about it for a while. Takes about 1 hour and 40 min in total to make. Prep time 20 min, cooking time 1hr and 20 min and this can serve close to 10 people. Put them in a bowl and add the rest of the ingredients. As for garlic, you can either mince, press, or grate on top of the potatoes. Heat up your oven to 400F degrees, transfer potatoes to a baking dish, aluminum tray, or a baking tray. Sprinkle the oil and the rest of your ingredients on potatoes from the bowl. Cover your tray with aluminum foil and put in the over for about 1 hour. Check your potatoes after 1 hour to see if they are fully cooked. If so, you can uncover, pump the temperature up to 425F-435F and put them back into the oven. Leave them in there for about 15+20 min to brown and crisp up. Once they are at the desired color, take them out of the oven, sprinkle some fresh dill on top and voila! Enjoy!